Herewith some assorted thoughts regarding the current firestorm about the federal government’s mandated employer coverage of contraceptives, abortifacients, and sterilization as part of required employee health insurance. In the title of this blog post you see the trajectory of actions and consequences that will likely occur if at this point citizens do not vigorously protest this government-sponsored attack against freedom of conscience. There are two progressions in this title, each of them very easy to grasp. This series is also marked by a progression of punctuation. Fearful doubt is sown among religious people about the propriety of invoking religion and using religious arguments in the public square. Though their brow-beaten silence may be laced with questions, it nonetheless remains . . . silence. But the question mark becomes a period when power brokers assume that silence means consent, as lawyers and lawmakers usually do. These brokers become emboldened. Today, freedom of conscience. Tomorrow, freedom of speech. But it’s the exclamation mark that becomes the most defining of all punctuation. For, unlike the question mark of silence and the period of consent, the exclamation mark of surrender comes not from the outside, but from the inside of a person. The most common posture at that point is staring down at your shoes. Having refused for so long to lift your eyes (and hands, and voice), you discover now that you cannot lift them. What if, in a thoroughly secularized, post-modern society, the church is the only institution, and religious people are the only people, who have an informed, functioning conscience? To those who continue to insist that the church as an institution has no business addressing matters of public morality, my simple question is this: If not now, then when? This Sunday, at masses scheduled throughout all of Chicago, a letter will be read from Francis Cardinal George to Roman Catholic worshippers. After raising the specter of civil disobedience, he will ask them, first, to pray and fast on behalf of wisdom and justice, and second, to write Congress in support of legislation that would reverse the Administration’s mandate. Alarmism, you say? If not now, then when? Confusion of kingdoms, you say? If not now, then when? 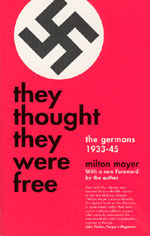 In the dedication of his 1954 book, They Thought They Were Free: The Germans 1933-45, Milton Mayer cites these words from the Christian Bible: “The Pharisee stood and prayed thus with himself, ‘God, I thank Thee, that I am not as other men are. '” His broader implication was that we Americans need to be very cautious in our evaluation of German National Socialism, and recognize that full truth is neither right nor left. The book’s message was cemented for me as I interrupted my reading to listen to the speech of Eric Mataxas at the 2012 National Prayer Breakfast. If you haven’t yet listened to it, you owe yourself. Last thought. In 1936 the synod of the Reformed Churches in the Netherlands officially condemned membership in the Dutch organization sympathetic to German Nazism (Nationaal-Socialistische Beweging in Nederland). The synodical decision appealed both to Scripture and to the Reformed Confessions (creeds whose teachings govern the life and beliefs of members). Someday I’d like to write more about this ecclesiastical heroism. It’s powerfully relevant! Nelson, I’ve heard some of my Redeemer colleagues talk about the heroism of the Gereformeerd Christians of the Netherlands during the German occupation. These are stories from their own families. Hey Tom, it took a few years but we are now PCA. And then . . . they came for me . . . And by that time there was no one left to speak up.” However he said it differently each time. The point, however, is that he did NOT do something about it as Mayer suggests. He spent six years in a concentration camp because “they came” for him. So very true, may God add many more trumpeters of His rule, authority, and kingdom such as yourself in the church of Jesus Christ. I will continue to pray for your ministry and enlarged voice in the PCA.